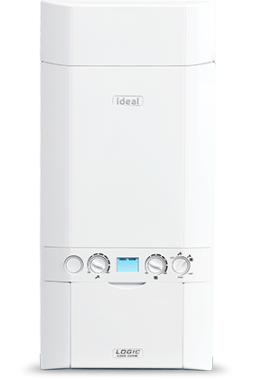 DISCONTINUED.The Logic Code Combi ES is a gas fired, wall mounted and condensing boiler made and manufactured by Ideal. As a Combi boiler it is supplied directly by the mains water so is best suited to for smaller properties as it doesn’t require an external water tank or cylinder. This unit has an output rating of 38kW making it ideal for properties with a higher demand for hot water. There are also models with 26kW and 33kW output ratings. This unit has been optimised to meet the SAP and DER ratings with an efficiency rating of 91% making it an A rated boiler. This boiler is compact in size, with built in pipework, minimal height and is lightweight which makes it easier to install to help you save time and money. It includes a built in stainless steel recuperator which is located in the flue exit. The steel recuperator can pick up and recycle waste energy that normally gets lost through the flue terminal. This energy is then collected and used to warm up the cold hot water supply. It also features reduced pluming on DHW and less waste DHW water as the DHW inlet is preheated. This boiler has a slightly higher flow rate than standard boilers of around 10%. It includes 2 years warranty on parts and labour so you can have peace of mind that you have purchased a highly reliable boiler.